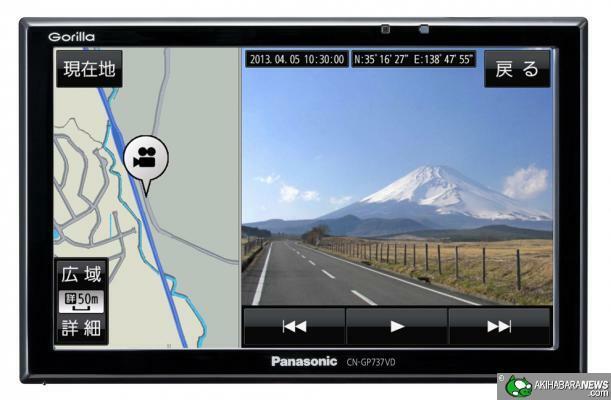 Panasonic Corporation Automotive & Industrial Systems, Inc. (Yoshihiko Yamada representative) has announced the release of five new models SSD portable car navigation “Gorilla Eye”, sequentially from the 20th September. Pansasonic has led the market in car navigation systems, due to its “positioning accuracy”, “map readability” and “system usability”, with 400 million units sold as of March 2013. It is equipped with a drive camera function, CN-GP737VD using which you can record and traffic situation in front of the vehicle, view the scenery of the drive in in conjunction with the engine start-up. In addition, it is equipped with all models 7V type wide VGA liquid crystal display, map and segment also can use it easy to look comfortable in a high-definition big screen. Furthermore, by adopting for positioning the current location by using three pieces of information “GPS”, “gyro” and Quasi-Zenith Satellite” Precision positioning method to “triple precision” and under the elevated building or city in the city center “positioning accuracy” is particularly enhanced. It is equipped with SBAS from Japan Aerospace Exploration Agency of Japan, which will help correct the position in areas where it was earlier difficult to receive signals from GPS satellites, particularly where there are city buildings and in mountain areas.